Laboratories throughout the world have been praising the KWIK-STIK for decades. That’s because its simple, all-inclusive design makes life easier for lab techs while reducing chances for errors. Each KWIK-STIK contains a qualitative lyophilized microorganism pellet, ampoule of hydrating fluid and inoculating swab. Everything you need to grow reference cultures for QC testing is included in this one handy device. 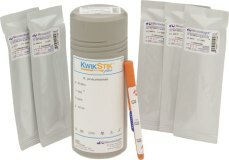 Available in packs of 2 or 6, KWIK-STIKs are universally used for all types of microbiological control testing. Some laboratory applications require strains that are a fewer passages from the original reference culture. For those special instances, we offer KWIK-STIK Plus, which combines microorganisms that are just two passages from their reference strains, with our signature KWIK-STIK format. Each device features a qualitative lyophilized microorganism pellet, ampoule of hydrating fluid and inoculating swab; so everything you need for growing control cultures is included in one handy device.